Are you ready to quit smoking? Congratulations on making the choice to live the healthier lifestyle that you know you deserve. The reasons to give up your smoking habit are numerous. The American Lung Association reports that, “Every year in the U.S., more than 480,000 people die from tobacco use and exposure to secondhand smoke.” Smoking increases and aggravates certain conditions, such as asthma and allergies, and has been proven to put you at risk to develop others, not the least of which is cancer. Besides the health advantages of quitting smoking, there are also social benefits. If you are a smoker and a parent, your child is twice as likely to start smoking as the child of a non-smoker, according to research done by the University of Washington. Smoking leads to the yellowing of teeth, early wrinkles, dehydration, and shortness of breath. Have you ever noticed the smell of smoke clinging to your hair, clothes, and home? Maybe not, because smoking numbs your sense of smell and taste. If you have previously tried to quit smoking, only to start right back up again, you know that it is no easy task. But if the patches, gum, prescriptions, counseling, and other methods that you have tried in the past have failed, do not despair. Hypnosis has been shown to be an effective treatment for an addiction to smoking with certain patients. Despite what many believe, you are not unconscious when you are in a hypnotic state. As the American Association of Professional Hypnotherapists explains: “Hypnosis is simply a state of relaxed focus.” In this state, your mind is calm and more open to suggestion and influence. Maybe you’ve seen the episode of Friends where Chandler uses a hypnosis tape to quit smoking. Unfortunately for him, it was created for women, and while he does quit smoking, he begins to act more and more feminine. It was good for a laugh, but not very realistic. Hypnosis is not brainwashing. It is a process that helps reach the thoughts and feelings that are buried in the subconscious. It does not alter who you are, but instead, can help you become the best version of yourself. Under hypnosis, you may be encouraged to consider the negative outcomes of smoking, such as the way it tastes (like exhaust, for instance), the health risks (receiving a cancer diagnosis), or how it makes you feel (extremely thirsty). These suggestions create an association in your brain between lighting up a cigarette (or any tobacco product) and something that is uncomfortable or undesirable, such as feeling parched or poisoning your body. Self-hypnosis is an important technique used in this process. Learning how to self-hypnotize gives you the ability to manage your cravings when the urge to smoke arises. 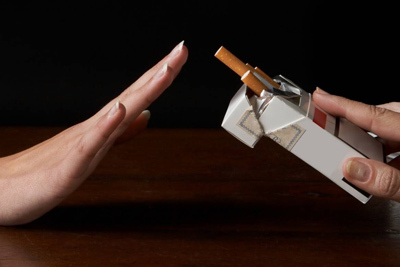 The key to the success of using hypnosis to quit smoking is having a way of reinforcing what you have learned in your sessions when you are home or out. Repeating affirmations can decrease the need to for nicotine until, eventually, your body gets past the physical addiction to smoking, and your mind has broken the muscle memory link that has you reaching for your lighter out of habit. No one can make the choice to quit smoking for you. That is up to you. So if you are ready to make the changes that are necessary to live a healthier and more fulfilling life, then contact Advanced Care Hypnosis. Daniel Rose is an experienced and compassionate professional who will help you conquer your cravings, increase your willpower, and give up smoking, once and for all. To book a sessions with Dan Rose and quit smoking with hypnosis call us today at 973-402-6882.